Journey into the unknown, and return a wealthy warrior. Click here to play! There are many wild spirits to be wary of, but others that will pay you for your deeds. Spin up the best combinations and reap the benefits! 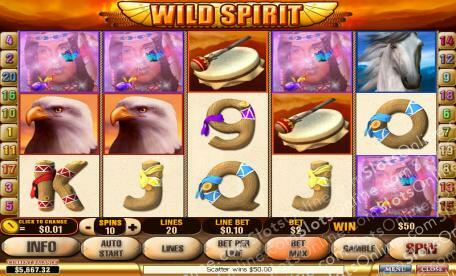 Wild Spirit is an adventurous 5-reel slot that is played across 20 pay lines. The Horse is Wild and can be substituted in any winning combination in order to earn a payout. If you manage all five on an active pay line you will also win 5000 times your original stake. The Girl is Scattered and can show up anywhere on the reels, while the Chieftain is a bonus symbol. Spin him up on reels 1 and 5 and reap the Bonus Round rewards of up to 27 Free Spins, and an 8x multiplier! Step back in time and enjoy mother earth as she was meant to be in Wild Spirit. The Girl is Scattered and can show up anywhere on the reels. Spin up all 5 to receive a bonus of 100 coins. The Horse is Wild and can become any other symbol on the reels. There is a 5000 coin payout waiting for you if you manage to land all five on an active pay line. The Chieftain is a Bonus symbol and he can appear on reels 1 and 5. When he does you will be sent to the Bonus Round and can win up to 27 free spins.